Go Math Grade 6 Ch. 12 Review/Test with Answers and Solutions is strictly for HOMESCHOOLERS and PARENTS who want to help their children solve review test questions in Go Math workbook at home. This chapter includes Go Math review/test sheets, and answers with detail explanation on how to solve. The answer sheets are in black bold or in red, so that you can choose the version you find easy to read. You also can purchase the bundle for Go Math Grade 6 Ch. 1 through Ch. 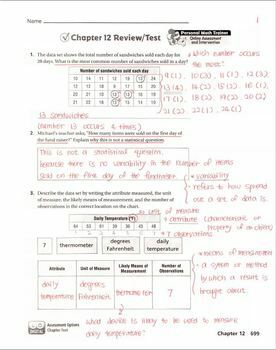 13 Review/Test with Answers that contains all 13 units in Go Math for grade 6 ENTIRE YEAR. You also can purchase the bundle for Go Math Grade 3 Ch. 1 through Ch. 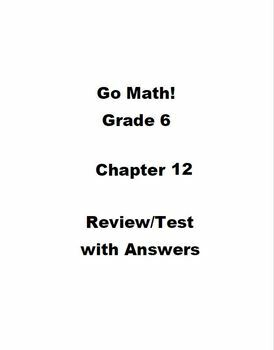 12 Review/Test with Answers that contains all 12 units in Go Math for grade 3 ENTIRE YEAR. You also can purchase the bundle for Go Math Grade 4 Ch. 1 through Ch. 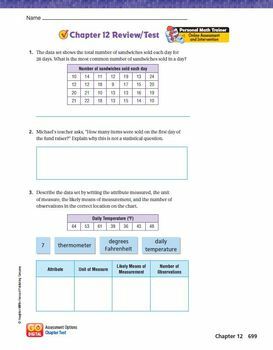 13 Review/Test with Answers that contains all 13 units in Go Math for grade 4 ENTIRE YEAR.